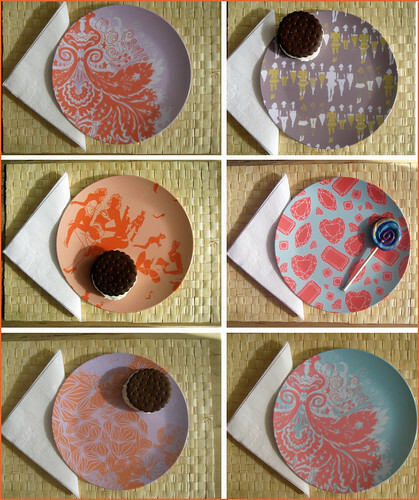 I designed these melamine plate sets for Freddy & Ma. 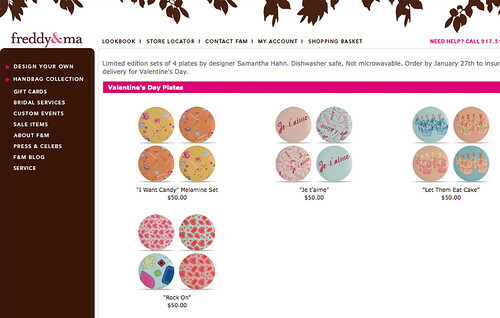 They’re featuring some for V-day….must be all the je t’aimes and gems they thought would be perfect. I picked some up for our place and took those photos and then ate the ice cream sandwich featured. I didn’t however eat the ceramic lollipop that I made a while back. I also designed pillows, bags, and other plates for them that are available when you click on “design your own” and then “select pattern.” There are girls, bike wheels, birds, feathers, brocades, etc. So take a peek. There are some fab designs by other designers too, like Jules of Brandbird. Thanks so much!!! Yea, it’s fun to choose your own designs….I still have not made a purse yet but it’s on the agenda! These look beautiful. Great work. Thanks so much B!!! So happy you’re checking in on Maquette! Hope you had a fun party weekend . XOXO. ooh, i lOVE THEM!! congratulations- they look amazing! Did you see that Jules has designs in there too. thanks caroline. They were fun to design. We use them all the time. They won’t break so you can play fast and loose with them. I just designed another set for them inspired by needlepoint. I’ll show them to you next time we brunch…..soon I hope.